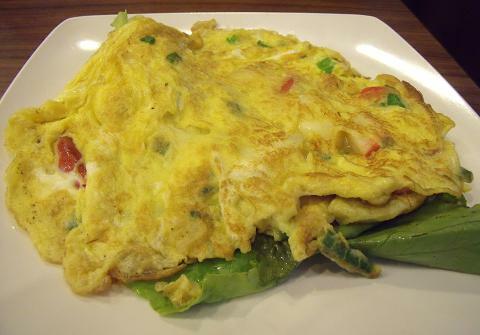 Omelette (sometimes spelled "omelet") is a very popular dish around the world. It is made from egg and often has a filling. Optional: Filling of your choice - Important: you must only use fillings which are either pre-cooked, or safe to eat raw but warmed. Break the eggs into a bowl and mix well. Add one tablespoon of milk for each egg - two eggs should be enough for a small omelette. Pour the eggs into a non-stick frying pan. Gradually heat the pan while stirring the egg mixture. You should stop stirring when the mixture begins to solidify, and instead make sure the egg is loose around the edges (you may also need to tilt the pan to spread the egg around). When the egg has solidified you should be able to slide it around in the pan. At this point you need to turn it over - the easiest method is to use a flat spoon or spatula to turn it over (which of course will be easiest if cooking a small omelette). Place the filling on top of the egg, and when the bottom side is cooked, fold the egg over on top of it.